Do you like math? There are a handful of people that live and breath mathematics. For these people, the addition, subtraction and other principles are like old friends. The idea of multiplying and dividing is a treat. Unfortunately, for other people, and many kids, math is a subject that they dread. There can be many reasons for not liking the subject of numbers. Maybe they don't understand the concepts or they just don't like the subject matter. But, when there is a strong discord, parents can look for means to make the subject more palatable. A great way to make math fun is either by means of a game or other format. Since my son likes to read, I've found that math based books are a perfect format. 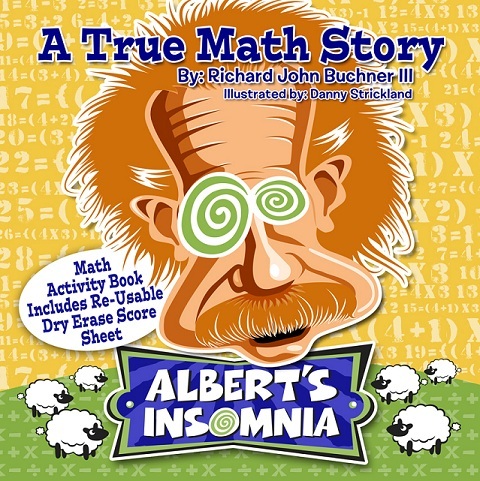 The book A True Math Story, by Richard John Buchner III incorporates math concepts into a well written story. In conjunction with the math game Albert's Insomnia, kids can start to look at math not as just memorization but a means to an end. Math can be helpful and more importantly fun. My boys and I read A True Math Story together. Each time we see a different math problem or concept. The easy concepts of addition and subtraction are easily identified. As the kids grow, you can explore other topics like bases and exponents. My son likes this book because of the story. It's about a boy and his grandfather. Putting aside all the math information, the story itself is engaging and can be read many times. My kids gravitate to this book on a weekly basis. A book like A True Math Story or other math based games can take away the boring math stigma. Give your kids the fun tools to make math their favorite subject. Disclosure: I received this book to review. How neat to hear about a fun book about math! It's too bad that most books you see that deal with math are mathbooks. Maybe if we there were more fun books like this, more kids would be open to enjoying math more. This looks like something my kids would love. My kids loathe math, so I am always looking for new ways to make it fun. My kids love math and they would like this. I'll have to put this on their list. My daughter hates math. I think this would be a great book for her.